amendments adopted from time to time by the Cemetery. 1. Cemetery means the Ridge Park Cemetery, located in Marshall, Missouri. 2. Interment means inurnment, entombment, or burial of the remains of deceased person. 3. Interment Space means a Grave Space. 4. Interment Right means the right to inter in an Interment Space. 5. Owner means the person or entity that owns an Interment Right as determined by the Cemetery’s records. 6. Grave Space means a single earth burial space. 7. Lawn Crypt means a crypt specially constructed, drained and vented for below ground Interment. 8. Mausoleum Crypt means an aboveground burial space in a mausoleum. 9. Cemetery Deed means a legal instrument conveying an Interment Right to an Owner. 10. Memorial means any marker, nameplate, or identification or memorialization. 11. Contractor means any person or entity, except a Cemetery employee, engaged in or performing any work in the Cemetery. unused Interment Space will be made at time a burial or an assignment is requested. 7. No interment Right shall be purchased for investment of speculative purposes, and any such purchase shall be void and all interment Rights shall revert to the Cemetery. charges have been paid in full. 2. After entering the Cemetery, funeral processions shall be subject to the direction of the Cemetery. Interment Spaces of similar value and location, or the cancellation of purchase agreement and refund of any money paid there under. the individual who contracted for the subject funeral and Interment. cremation remains must be placed in an urn vault. Cremation urn vaults may not be interred in a pre-existing regular interment, or placed in a foundation for a monument or marker. Markers or monuments may not be placed in the middle of an Interment Space. See Memorials & Monuments Section. reserves the right to reject caskets and graves linings that do not conform to these requirements. 8. The Cemetery is not responsible for establishing the identity of persons to be interred. 9. The Cemetery is not liable for any damages caused by delays in funerals due to causes beyond the Cemetery’s control or due to a protest to an Interment. before Interment in such other Grave Space. time by the Cemetery and all other fees and charges must be paid in full prior to a disinterment. sexton will be available. Cemetery’s account and sales office located at 925 South Odell, Marshall, MO is open 8:00 a.m. to 5 p.m. Monday – Friday. property for such purposes as the Cemetery deems proper. 3. Agreements for special care memorial funds can be provided subject to approval of the Cemetery with the rights to reject gifts. of property shall be made by the Cemetery or its approved Contractors using equipment approved in advance by the Cemetery. 5. The Cemetery reserves to itself a perpetual right of ingress and egress to and from all Interment lots, roads, and walkways in the Cemetery. such tree shrub or plant, or any part thereof, or otherwise correct the condition, as the Cemetery deems proper, without notice to any Owner or any other person. selling or developing such property for uses other than as a cemetery. 1. No Lawn crypt, above ground or surface mausoleum crypts is allowed except in designated area for these crypts exclusively. · Only temporary containers will be permitted that contain fresh flowers or artificial bouquets. · If the stone or metal memorial has vases that are permanent to the monument itself, these may be filled with fresh or artificial arrangements. · Artificial flowers with wire stems may not be stuck in the ground. · Christmas wreaths may be placed on stones, but must be removed on or before the 7th day of January. · No grave blankets will be allowed. · Any decoration the owner wishes to retain must be picked up and removed from the Interment Space within 7 days after placement. · The Cemetery may remove, without notice, any planting decoration, or other object placed on or about any Interment Space. The Cemetery assumes no liability for removal. Memorial Day. Public Notice will be given of this date. Public Notice will also be given on approximately the 7th day of January to remove Christmas decorations. · After the approximate seven-day span, all flowers or decorations will be discarded. · The Cemetery may remove and dispose of any and all decorations at any time that the Cemetery determines necessary. · The Cemetery does not allow the planting or cultivated shrubbery, trees, flowers, or ground covers around individual memorial stones. 3. No Enclosure of any kind such as a fence, coping, hedge, or ditch shall be permitted around an Interment Space. 5. No Interment Space shall be raised above the established grade. 7. No persons shall be permitted to bring alcoholic beverages into the Cemetery. Cemetery assumes no responsibility for Memorials, flowers, decorations, vases, urns, or other property on any Interment Space. 10. No Person shall be permitted to enter or leave the Cemetery except by Cemetery access roads. 11. Opening and closing hours will be posted at the Cemetery gates. Gates will be locked up the hour. 12. Any person found in the Cemetery after closing hours may be considered a trespasser. 14. All persons should refrain from walking on graves or climbing or sitting on monuments. noise shall be permitted in operating a vehicle through the Cemetery, and only licensed drivers may operate vehicles within the Cemetery. might cause any damage to the roads within the Cemetery. 17. All dogs must be leashed and walked only on roadways. 18. No hunting, trapping or participation in any sporting even or game activities is permitted within the Cemetery. location of lots and lots available for sale. All orders, inquiries and complaints must be addressed to the Cemetery office and/or the sexton. injury, disturbance or disregard of the rules. repair, or replace temporary metal markers. These temporary metal markers will be removed after a Memorial is set. 2. The Cemetery reserves the right to pre-approve a Memorial’s size, design, and inscription before it can be set in line with other stones in that section. “order” must be recited in a written agreement to the Cemetery. Verbal agreements or representations will not be binding. abide by these Regulations prior to making any installation. 6. No installation of any Memorial shall be made without the written authorization of the Owner or the Owner’s legal representative. installing replacement Memorials. All memorials that do not conform that do not conform to the Cemetery’s rules shall be removed at the cost of the Owner. to remove, change or correct the offensive or improper Memorial, inscription or object without notice, at the expense of the Owner. 9. 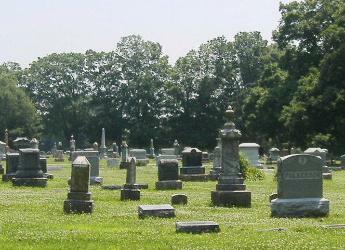 In the “Memorial Lawn Section” of the Cemetery, Memorial’s must be flush with the established grade. representative of the deceased veteran has signed a foundation purchase agreement and an installation agreement with the Cemetery or a Contractor. 11. No more than two burials shall be identified on any flush Memorial, unless approved in writing by the Cemetery prior to installation.